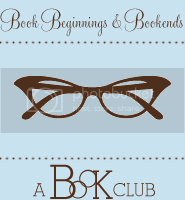 I joined the Book Beginnings and Bookends book club! I have fond memories of wine, gossip and better reading habits from my last club. A virtual club meeting means that I am only left with the books, but so far that is working out for me. I can drink wine will I am reading the other members' posts! The current book is Ape House by Sara Gruen, of Water for Elephants fame. We are asked to answer questions from the book on our blogs, so here we go! It hurt my brain a little, particularly when I tried to pretend that I hadn't read ahead! I would love to discuss further in the comments. You can join the group here. 1. What was your initial reaction to the idea of a language lab with bonobos who are capable of having conversations with humans? I was interested! I find our relationship to apes fascinating. There is still so much more to learn from them. I was also probably a little nervous about animal cruelty. The word "lab" conjures images of needles and cages. I am uncomfortable at zoos as I feel like those animals should be in their native environments. I understand that zoos can sometimes help protect a species from extinction and that our education is important, but it still makes me squirm. 2. Isabel said early in the book that the apes know they're apes and know that the humans are humans, but they don't see any superiority with either... What do you think the major difference is between the two? We do not share the same social restraints- I am assuming that the bonobos have their own rules! Their sexual behavior was the most apparently different from our own. They are free to have both homosexual and heterosexual encounters publicly with any of the apes in the lab (excluding little Lola). They have preferences, but it seems to be more of an admiration than a romantic relationship. We also do not live in a matriarchal society. Bonzi is in charge of their group and thus far her superiority has not been challenged. She is not their mother, and yet both the males and females follow her. This is not unheard of in our culture, but it is not the norm. 3. What are your thoughts on John and his feelings toward Isabel? How do you think their relationship will play out? I am hoping that their romance is never realized. His relationship with his wife is strained by her depression and new career, which might make Isabel more attractive. They hardly know each other (at least by chapter 12). I think his attraction is just an escape from stresses at home. If I had to guess based on the clues the author has laid out, I'm sure there will at least be some kissing in commiseration of their battle to get the apes or in celebration of their return home, particularly with Amanda in Los Angeles. Amanda will find out and be hurt but I don't see Isabel and John running off into the sunset together. 4. How do you think Isabel will respond to the apes being taken? I admit I read ahead, but her reaction isn't a surprise. She won't stop until they are in a safe environment where she can be close to them again. She considers them family. Without a close human family of her own and a less than perfect relationship with her fiance, they are all she has. 5. Do you think Celia is part of the team that ambushed the learning center? No. She cares about Isabel and the apes too much to risk their safety. I think being part of an animal activist group could be congruent with the activities at their lab. She is definitely odd and secretive. Isabel trusts her and we haven't been given enough clues to make me believe that she has a dark side. 6. What are your thoughts on John and his relationship with Amanda? He loves her. They have been together for most of his adult life. His career is being challenged and Amanda's depression forces him to suppress his own needs. Her move to LA is threatening to make things even more difficult. He is looking outside the relationship for an escape. Yes, Celia is odd, but I don't think she's involved either. This is great! I've been looking for a virtual book club to join. Thanks for sharing it. Do you need to 'officially' join somehow or do you just start reading. Maybe I'll join in on the next book. Again, thank you for sharing this!